Siblings, a photo by PhotoPuddle on Flickr. I took this today whilst walking through the park. We didn't have much planned for the day but as the sun was shining I decided we had to get out and enjoy the weather. It will no doubt go all cold and wet again tomorrow. I love this photograph quite simply because it's of my two beautiful babies. They make me so happy and it makes me extra smiley that they get on with each other so well. 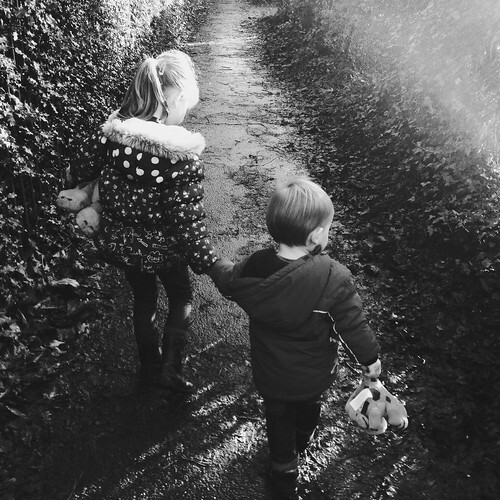 My daughter does a brilliant job of looking after her little brother and he looks up to her so much. Even though there's three and a half years between them they still play really well together and it's lovely to watch. So far there is no sibling jealousy of any kind and they are never mean to each other. Long may it continue. I really hope they stay the best of friends forever.